This is kinda weird, like a magician's trick I pulled on myself. 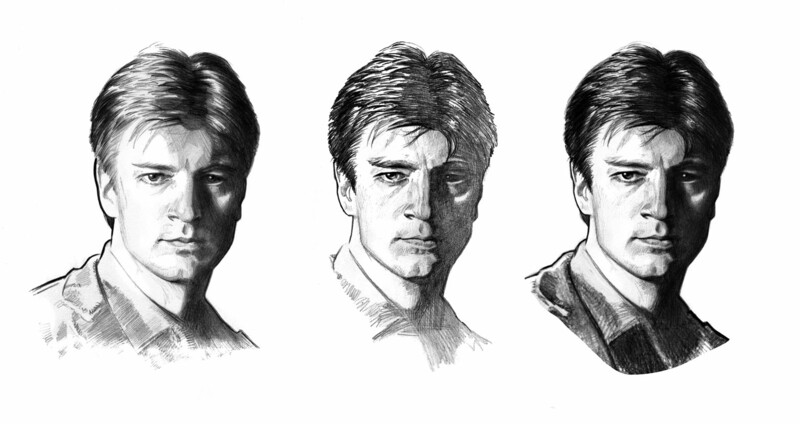 I drew this picture of Mal, played by Nathan Fillion about a year and a half ago. That's the one on the Left. I liked it but felt like it wasn't quite right but didn't know why, and banished it in a pile of near-misses. I just came across it and saw clearly what was of; Nathan's nose doesn't look like that, the upper lip is wrong, cheek, chin, so I drew it on an overlay to fix what was wrong, and only to fix what was wrong; that's the one in the middle -This really doesn't look like him. I scanned it, over-layed it on the first drawing in Photoshop (multiply), and Presto! 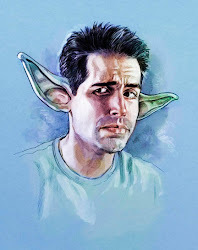 -now it looks like him. Two wrongs make a right.